Different versions to the major 2.8 release may have the filters and options placed and named differently. You'll have to check where the options are in that case in your GIMP version, for they may not correspond exactly with the ones explained here. Also, this tutorial gives a lot of information and alternatives for you to try in each step. 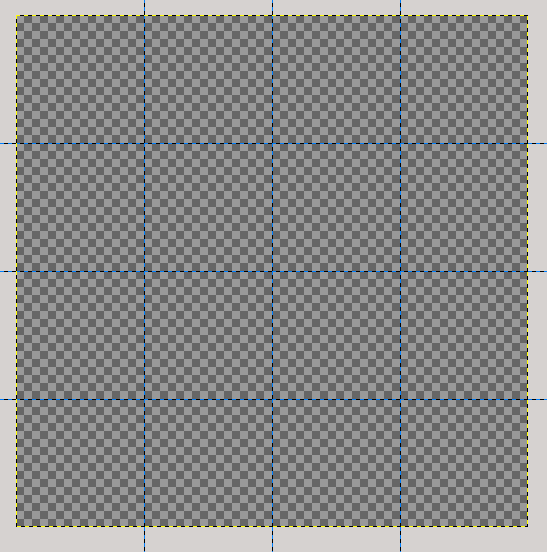 If this confuses you at first, follow the tutorial only with the first given alternative per section, temporarily ignoring all the "asides", "notes" and "you can also try", and once completed, then read all the other information on how to make variations, seamless base textures, seamless animations... to make the best of it. Because of the way the texture is animated, it means that we'll have to create several frames, and then merge all of them together in the same texture. 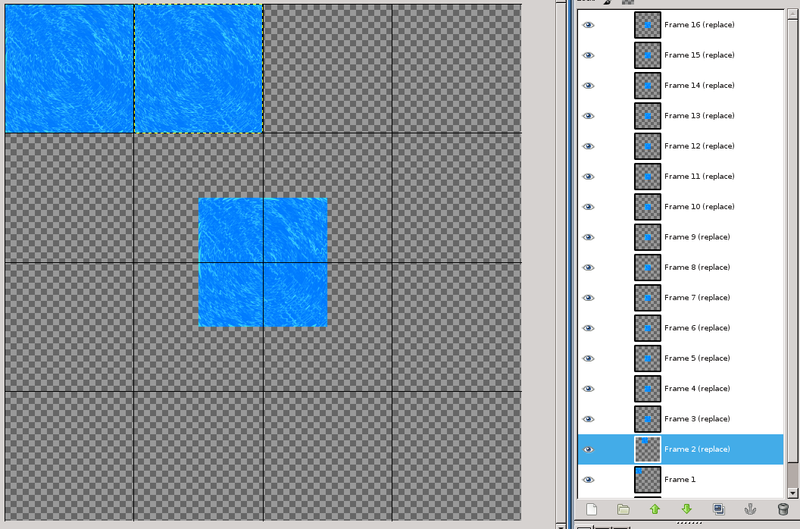 The reason for the latter is that the required scripting function demands the texture to be animated to be just one texture: if we want to animate frames, we have to put them all together in the same texture. 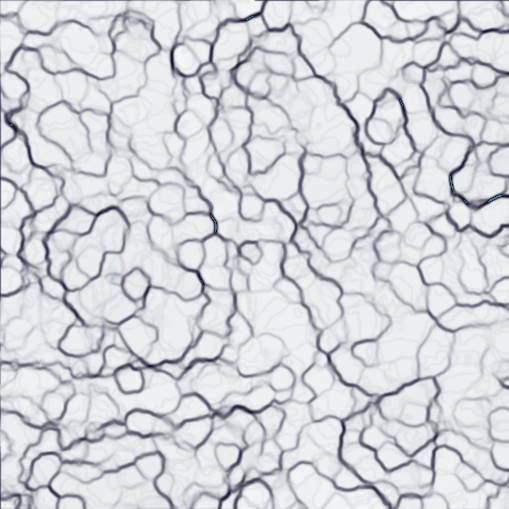 The process of merging all the frames together to create a single texture containing them all, will be explained by the end. 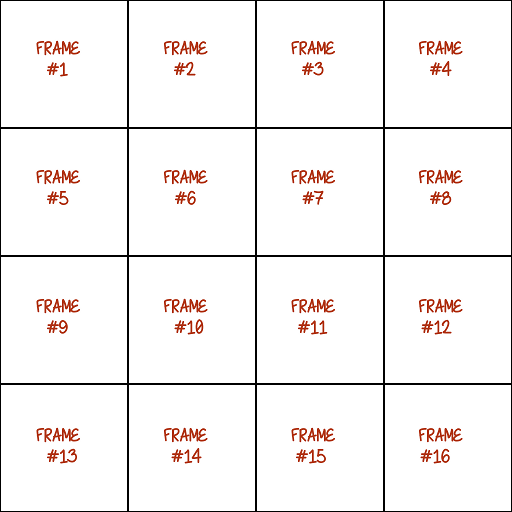 We are going to focus first in creating the animation frames separately, and for that, the process will be creating a base frame texture, and then using a GIMP filter that will create all the other frames. We'll be working here the base frame. 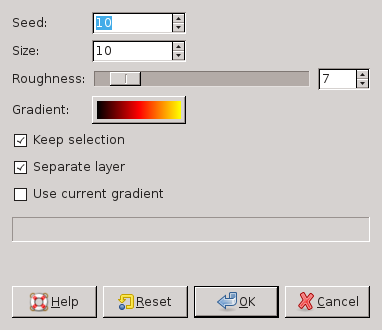 Now, a little bit of useful information about GIMP: under the "Filters: Render" menu, GIMP has several choices that will CREATE a texture, and we will be able of modifying some parameters, that will change aspects of this texture. 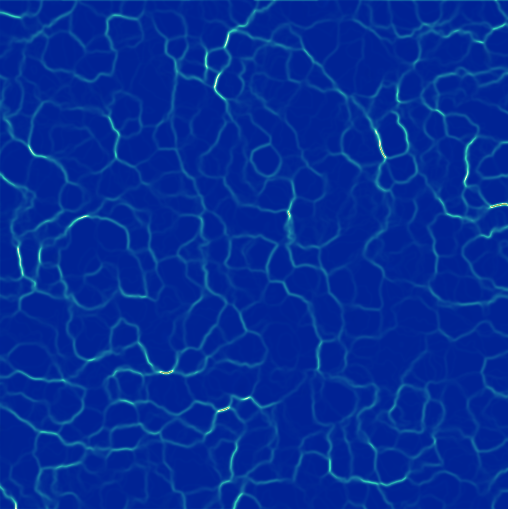 Well, interesting result, but how this could resemble to water in any way? 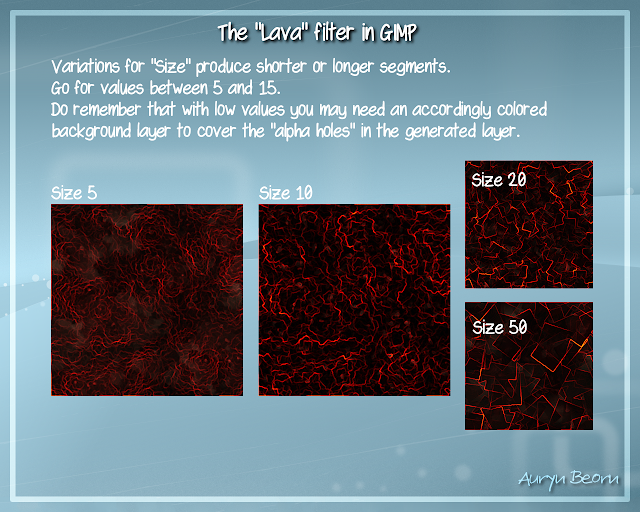 Let's explain the main parameters we can modify in this filter, and we'll begin noticing the similarities. 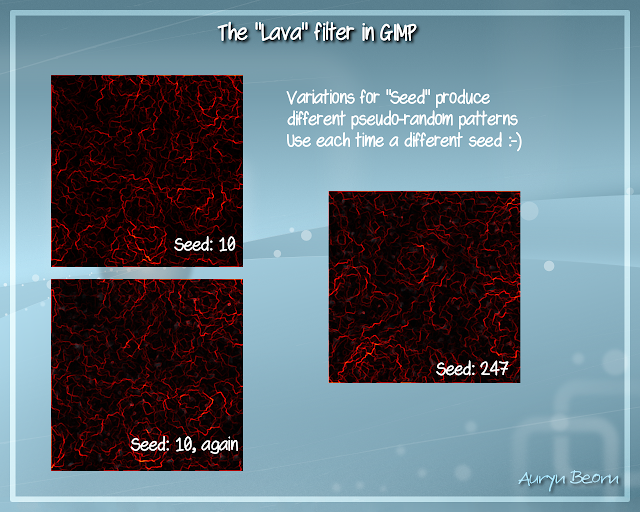 The first parameter we find for this filter is "Seed". 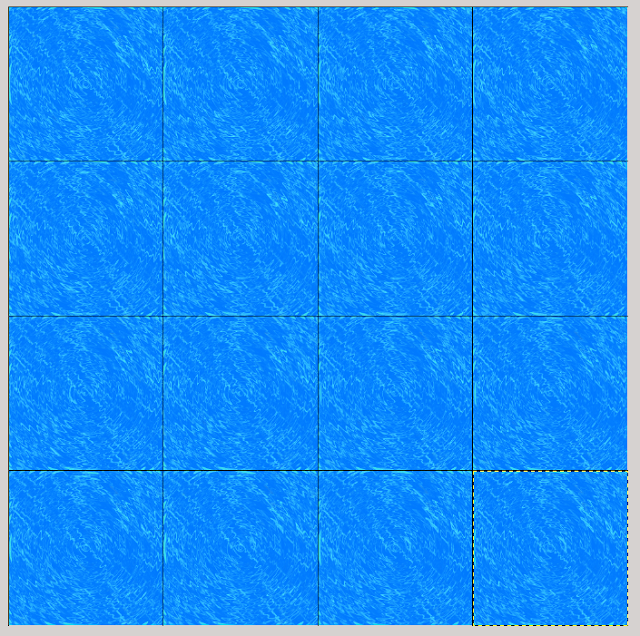 This "Seed" parameter is an initial value that is taken by the generator, influencing the distribution of the segments. 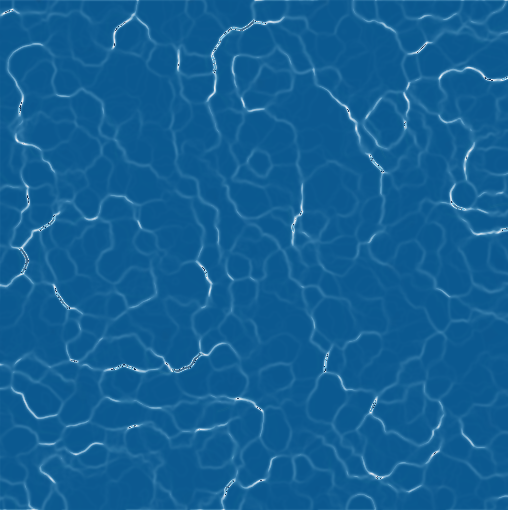 The patterns are generated pseudo-randomly. The same seed number may yield different segment distributions each time (like the picture below shows), but giving "Seed" a different value each time, we'll sure obtain different patterns for our base texture. 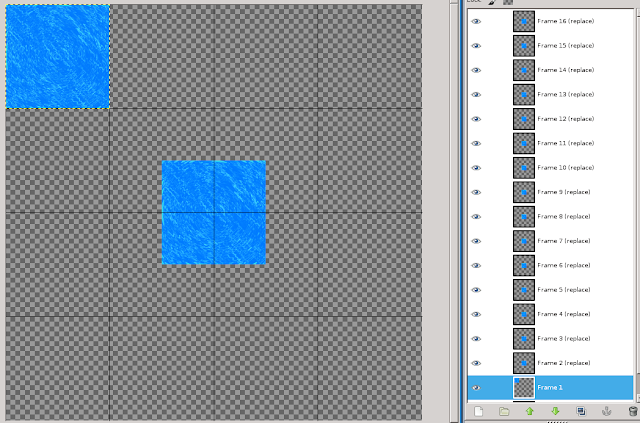 Next we find the "Size" parameter. 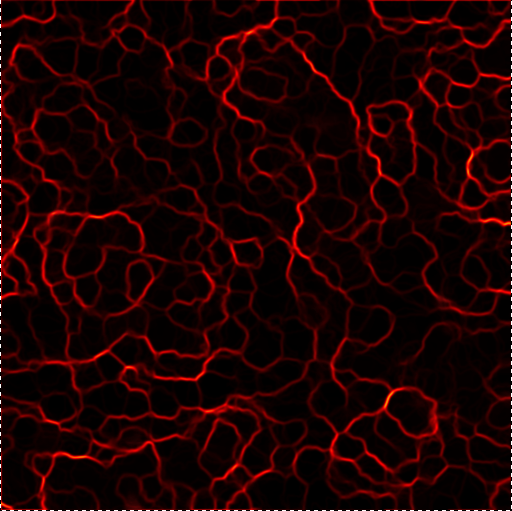 "Size" has an influence over the length of the "lava segments". Too high a value and we'll have here a few lines with long almost squared turns, which will not be useful for our effect. Useful values for us will be between 5 and 15. 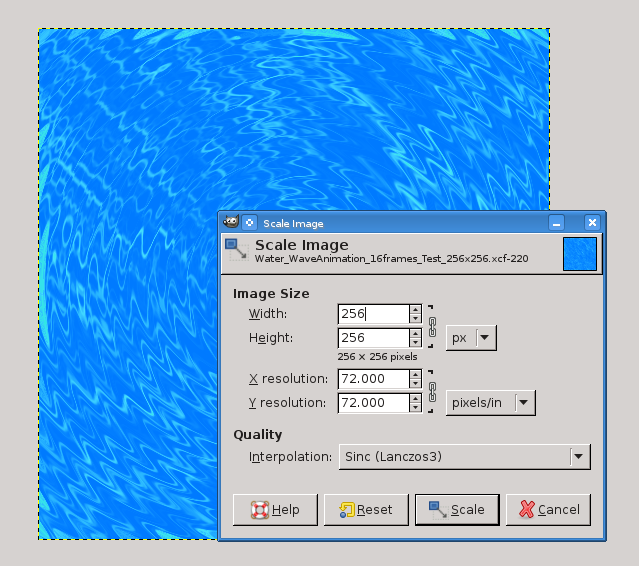 However, be aware that when size is too low, the generated layer may have some "alpha gaps", noticeable only when you copy it and paste somewhere else. Something you can do is creating a background layer with a color the closest possible to the background lava color, below the lava layer, and then merge the lava layer down to this solid background. The alpha holes will be covered this way. Now we find "Roughness". 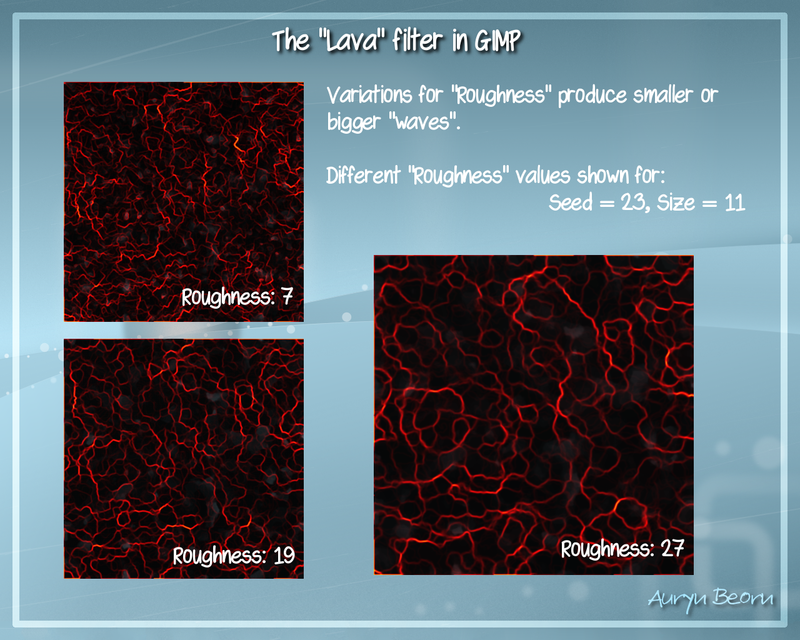 The "Roughness" parameter influences over the size of the "waves" that separate the "lava segments". At this moment, the similarities with water are more apparent. 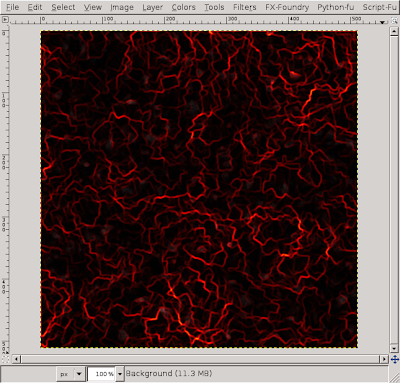 If only we could easily change the colors used in this "Lava" filter! Roughness is set to 27 here. 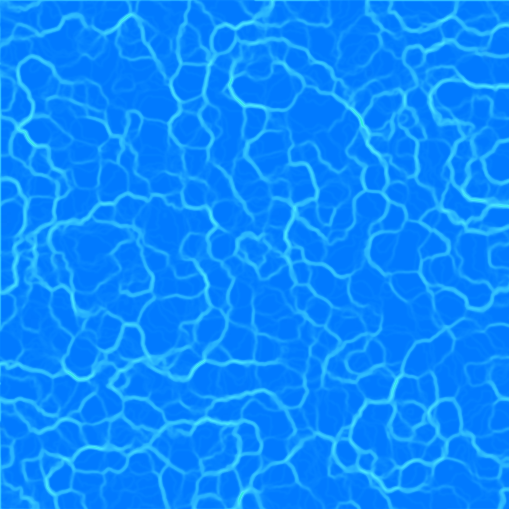 Nice lava-water base texture! 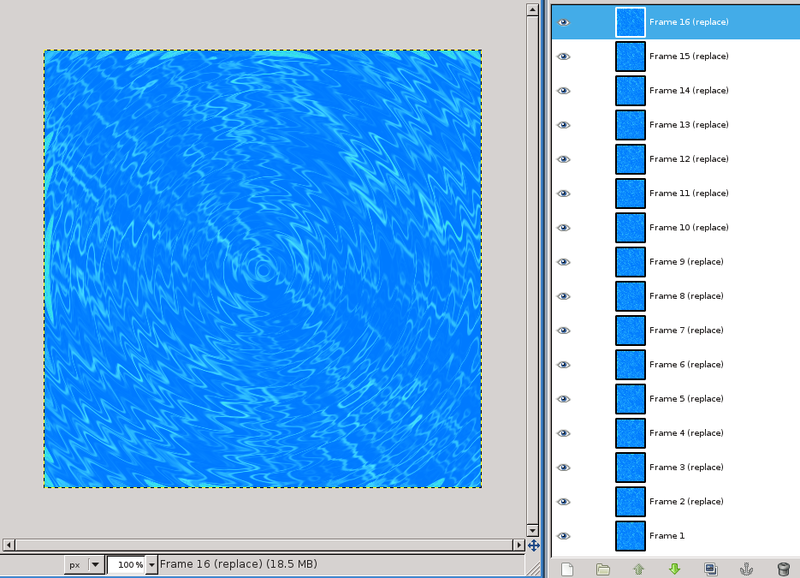 and we can even create our own gradient, then use it here. 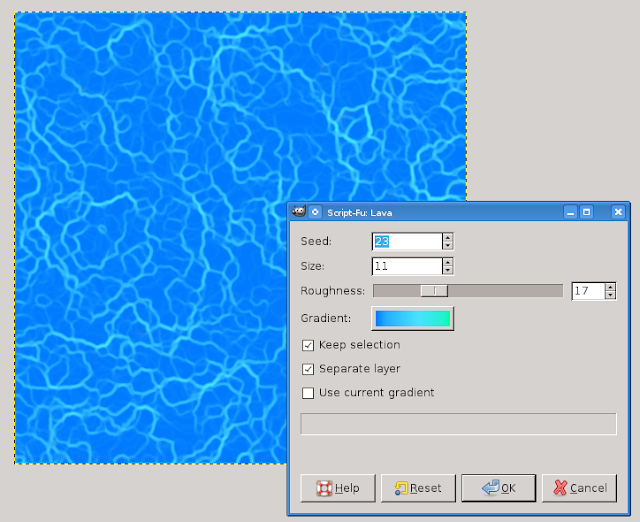 Save your work in your hard drive with a name like "Water_BaseTexture_Test.xcf"
This texture is obviously not seamless, so it would not be suitable to be used in sliding water effects. 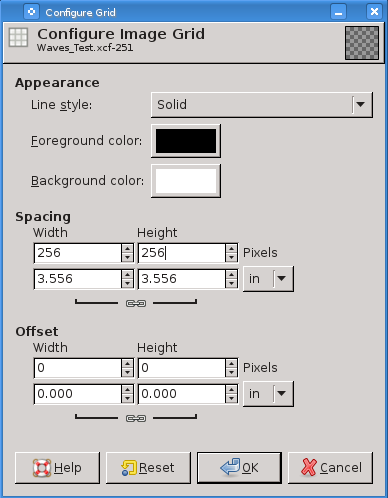 If you want to make it seamless, this is very easy in GIMP. 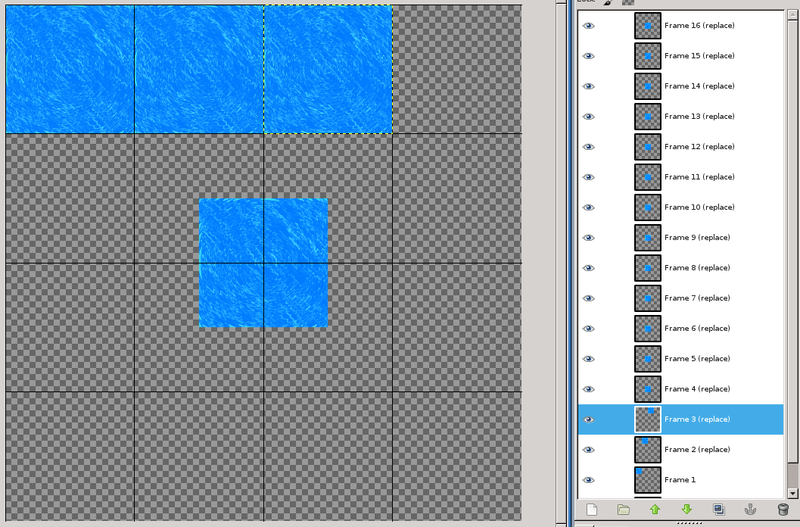 Now, select the following option, "Filters: Map: Make Seamless", and there we go! 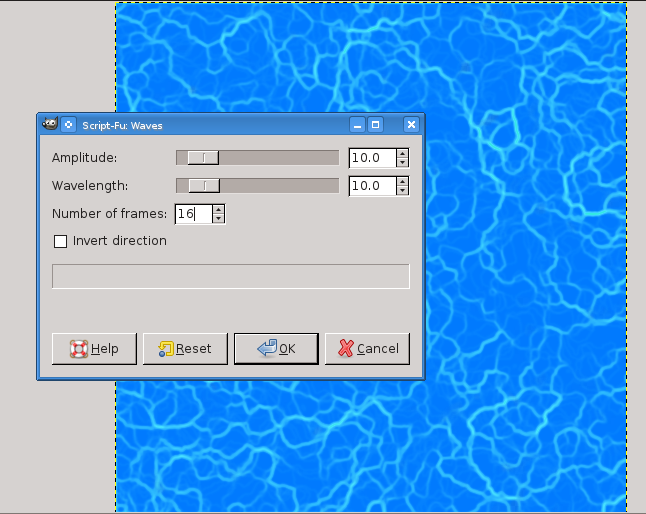 Save this new GIMP-document as "Water_WaveAnimation_16frames_Test.xcf" before continuing. Try also with "Smear" for the "Edge behavior" parameter if you use "Rippling". NOTE: Seamless animation for rippling, so I can tile several prims with it? Can I haz? BONUS: If you do this in the "Waves" kind of animation, you'll be able to seamlessly tile several prims with waves, for the way the seamless filter works in GIMP, will add a quarter of a wave in each corner. Way cool! 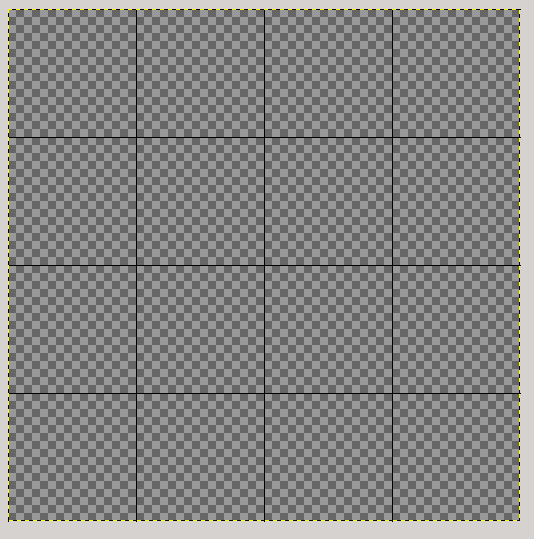 Once we have all the animation frames generated by GIMP, we have to put them together into one single texture that will be later used by a script. 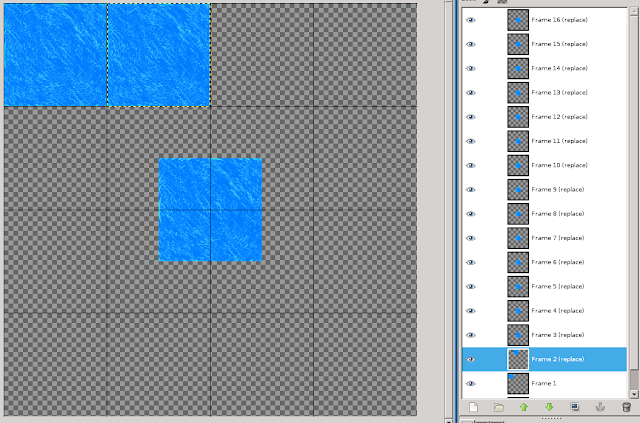 So the resolution of each frame has to be 256x256, so we can put them all together on a single 1024x1024 texture. 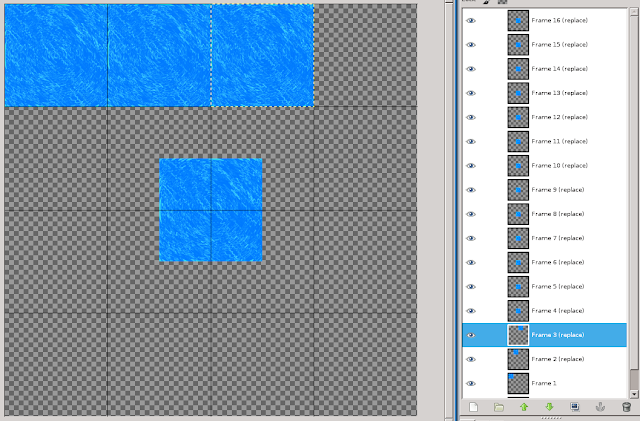 At first glance, it looks like it's going to be difficult to achieve that exact positioning of the layers. Nothing further than the truth, though. GIMP allows us two ways of achieving exact positioning of our layers over the image. 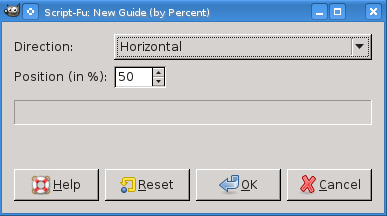 One of those ways is by using guides, the other way is by using a grid. Both ways have the same in common: we can create "lines" over the image whose only function is to "attract" the layers if we move them close to where those "guides" are. The layers will snap into place easily. So we're going to study how to create an arrangement of guides that could serve us, and we'll also learn how to do this with GIMP's grid. Create another 1024x1024 image where we'll study this. We don't need to save this one. Delete this layer if you wish. 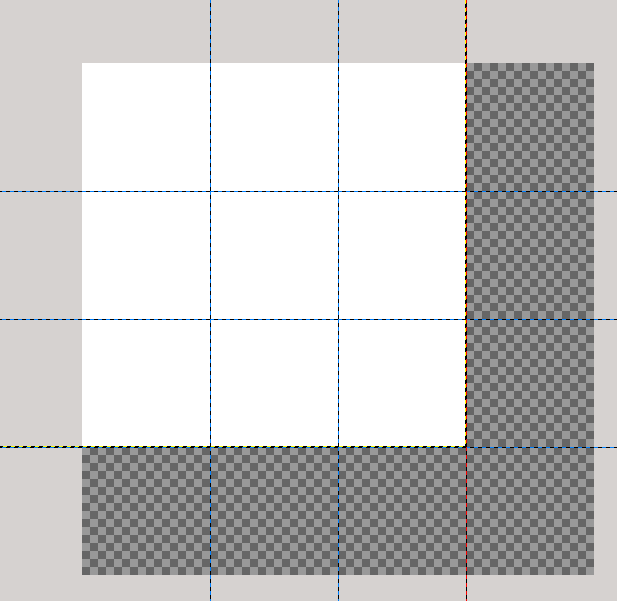 We see that this option has drawn a grid of lines on our image. 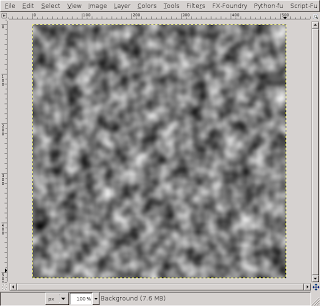 However, those lines aren't visible pixels that will be saved in our image. Those lines play the role of the guides we've used before. 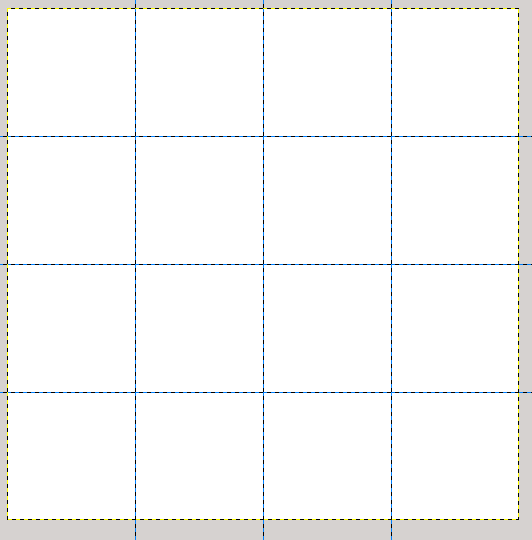 By having "View: Snap to Grid" ticked, when we move our layers close to them, the layers will snap to the grid lines, exactly as we've seen happen with the guides. Close this practice image and let's go back to "Waves_Test.xcf"
Now either prepare a grid of guides, as explained, or set up the 4x4 grid. Next is importing as layers all the frames of the animation, already resized to 256x256 pixels. 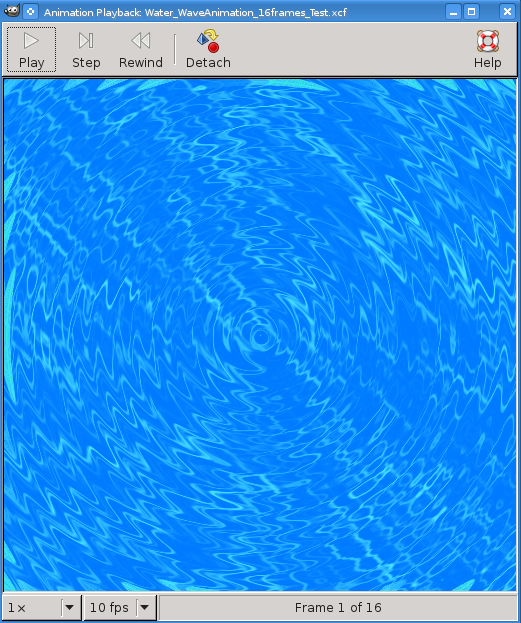 We do this by following the "File: Open as Layers..." option from the menu, and selecting the "Water_WaveAnimation_16frames_Test_256x256.xcf" file we saved before. Finally, we have to save our image. For this, we first make sure we've saved the .xcf file (CTRL S). 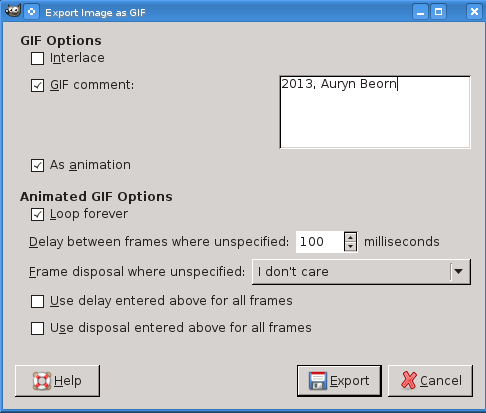 Now, saving files in GIMP as image files (PNG, GIF, JPG, etc.) is different since the 2.8 version. 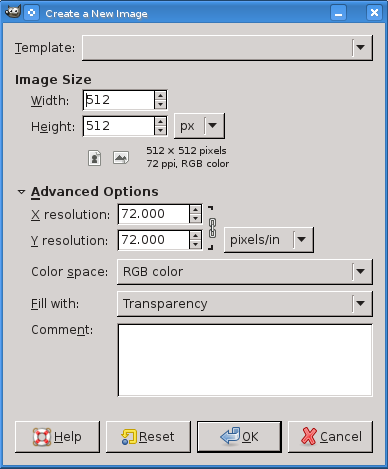 First, select "File: Export to" from the menu, locate where in your hard drive you want to save the file, and type a finishing .png as extension, to tell GIMP that we want a PNG file. 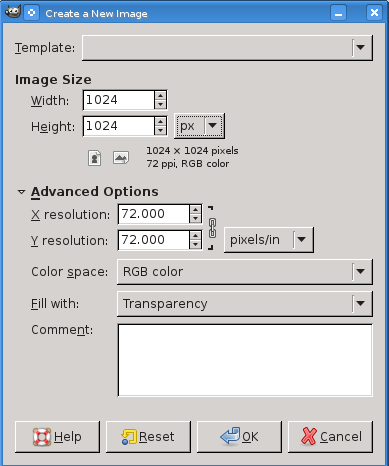 This will export the PNG file with alpha channel. 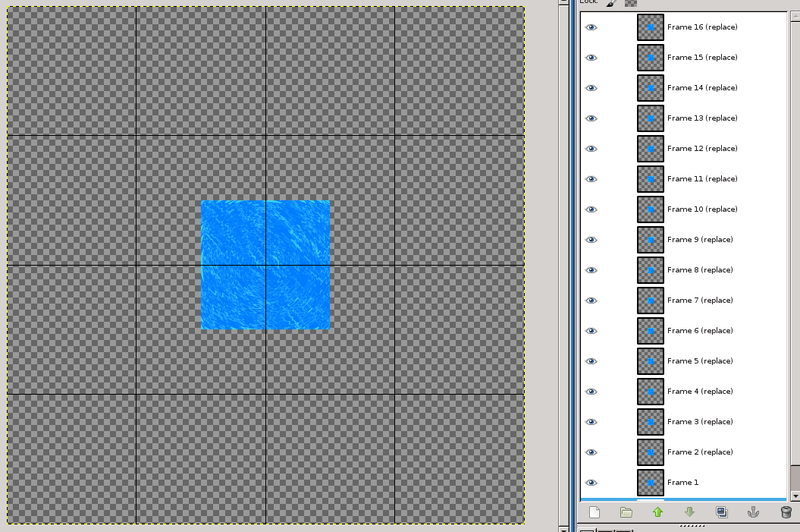 If our texture shouldn't have alpha channel (transparency), then we have to do one more step. Log into SL, go to the "Build: Upload: Image" option, select the texture on your computer, and upload it. Congratulations! Your texture is inworld and ready to be used. 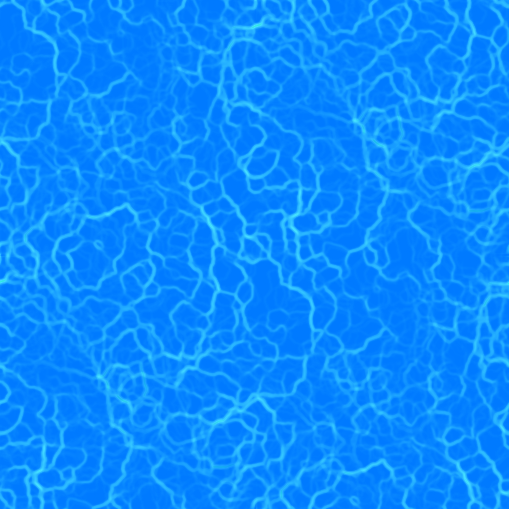 Now that you have this texture, head over the "Creating Zero lag animated water" tutorial, to learn how to script this in SL, so you have your finished water objects... not creating server side lag! 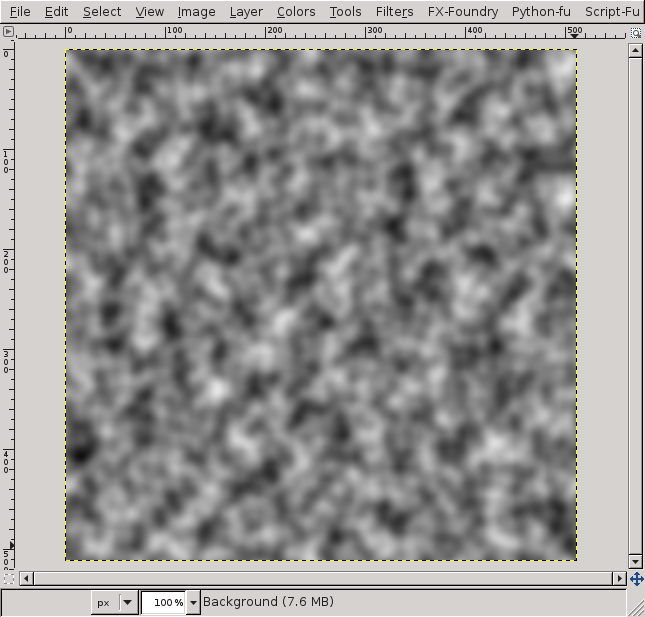 NOTE: Now that you've learned the hard way, this is, importing all the layers, using the grid, or the guides... You can benefit from a script created by Pedro Oval, that you can install in GIMP, and will help you converting all the layers to a texture suitable for being animated under a script in SL. Make sure you tick the "As animation" check box as well as the "Loop forever" one, add a signature if you wish in the "GIF comment" edit box, and hit "Export". Your GIF file with the animation is ready.